In an effort to give patients the strongest foundation in dental health, we provide the highest quality services in general dentistry. General dentistry includes a variety of preventative and restorative work on your teeth, gums, and jaw. It is our goal to diagnose and treat any problems in these areas at their earliest stages, before they become more painful and require more invasive dental treatments. Our dental practice in O'Fallon MO uses the latest in dental technology and trained technique to provide exceptional preventative care as well as minimally invasive restorative procedures when needed. In doing so, patients can achieve a healthy smile using the most comfortable and efficient methods possible. We invite you to experience the difference at Riverheart Family Dentistry. 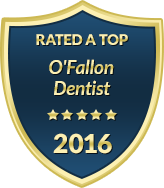 We proudly provide state-of-the-art dentistry in an environment that is warm and relaxing. Whether we are helping you maintain the health of your smile or restoring your teeth or gums, Dr. Schwarz will carefully guide you through your treatment plan so that you can make informed decisions regarding your dental health. To make our general dentistry services as stress-free as possible, we also offer extended appointment times and flexible payment plans upon request. With our expertise in the full scope of dentistry, you can trust Riverheart Family Dentistry with every aspect of your smile, through any stage of life. To learn more about our services in general dentistry, please contact our dental practice today. We welcome the opportunity to show you how comfortable and rewarding dental care can be in O'Fallon, MO.